Lebanese cuisine is characterised by its copious use of garlic, olive oil and fresh herbs. This salad is filled with diced halloumi, olives and chickpeas for a satisfying and healthy meal. Cook the Basmati rice according to the instructions on the packet. At the same time, heat some oil in a pan and gently fry the chilli, cumin and halloumi for about 2 minutes. Add the sun blushed tomatoes, olives and chickpeas and heat for a further 3 minutes. 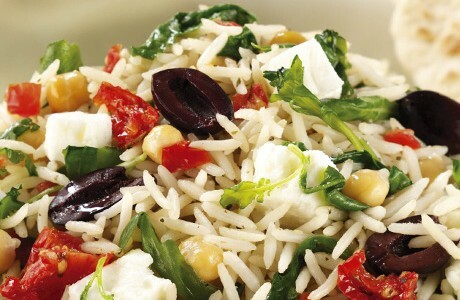 Stir in the cooked Basmati rice, rocket, coriander, mint and lemon. Serve hot with Greek yoghurt drizzled over the top and warm flat bread on the side.